Peter Paul Rubens often painted multiple versions of paintings, and many contemporary and later copies also often survive. Rubens frequently called upon his sizable workshop to execute his large-scale works, and his enormous popularity in his own and succeeding centuries encouraged the proliferation of copies. 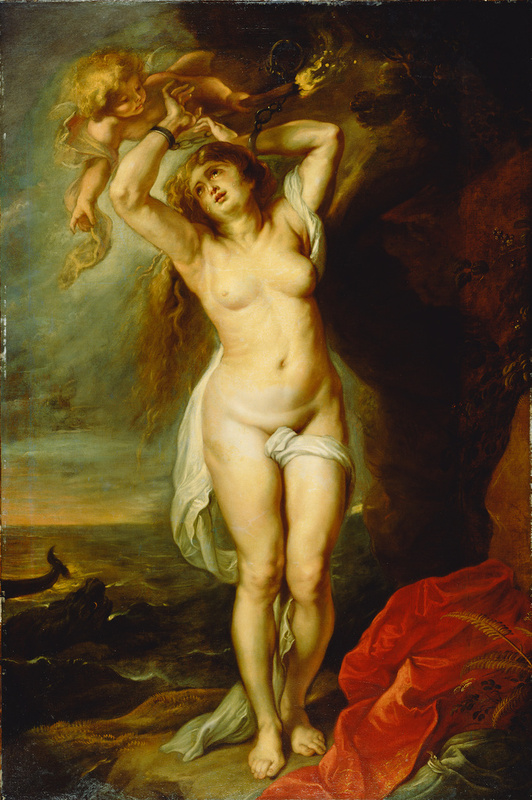 This artist emulated Rubens's fluid handling, vigorous contours, and Andromeda's subtle contrapposto pose. In the Greek myth of Perseus and Andromeda, an oracle declared that the beautiful Andromeda must be sacrificed to a sea monster. Chained to a rock near Joppa, she was rescued by Perseus, who subsequently married her. Scholars think that seven versions of Andromeda were made, although only three are known today. The other two versions of this subject include Perseus as well as an assisting angel. In this scene, Andromeda tearfully welcomes the angel, who will melt the chain with fire. Pieter de Boer Kunsthandel (Amsterdam, The Netherlands), sold to French and Company, 1956. French and Company, Inc. (New York, New York), sold to the J. Paul Getty Museum. Held, Julius, ed. Loan Exhibition: 15th, 16th, 17th Century Flemish Masters, exh. cat. (London, Canada: University of Western Ontario, 1957), unpaginated, ill.
Fredericksen, Burton B. A Handbook of the Paintings in the J. Paul Getty Museum (Malibu: J. Paul Getty Museum, 1965), p. 14. Fredericksen, Burton B. Catalogue of the Paintings in the J. Paul Getty Museum (Malibu: J. Paul Getty Museum, 1972), p. 71, no. 86, ill.
Kelch, Jan. "Peter Paul Rubens." In Kritischer Katalog der Gemälde im Besitz der Gemäldegalier Berlin (Berlin: Dahlem, 1978), p. 30. Jaffé, David. Summary Catalogue of European Paintings in the J. Paul Getty Museum (Los Angeles: J. Paul Getty Museum, 1997), p. 111, ill.
Wright, Christopher. The Schorr Collection of Old Master and Nineteenth-Century Paintings. Vol. 1 (London: MGFA, 2014), p. 222, fig. 248. McGrath, Elizabeth et al. Rubens: Mythological Subjects, Achilles to the Graces. 2 vols. (London: Harvey Miller Publishers, 2016), vol. 1, pp. 208-47. McGrath, Elizabeth et al. Rubens: Mythological Subjects, Achilles to the Graces. 2 vols. (London: Harvey Miller Publishers, 2016), vol. 2, pl. 124-61.